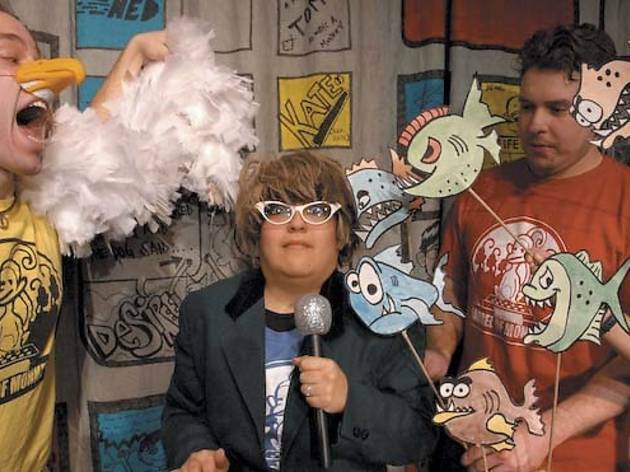 The kid-friendly company brings a bilingual version of its popular show That’s Weird, Grandma to Logan Square. Will a Grandma by another name be just as Weird? Stalwart edutainment outfit Barrel of Monkeys is betting on it. The Monkeys’ primary function is education. For the past 15 years, the group has sent its members (most of whom are working actors) into Chicago Public Schools’ elementary classrooms to conduct six-week-long workshops in creative writing. The kids’ stories then get turned into often wacky skits that are performed for the students by their actor-instructors. Since 2001, the Monkeys have also brought the stories to the public. At the Neo-Futurarium in Andersonville, the weekly showcase [node:138901 link=That's Weird, Grandma;] attracts a roughly equal mix of kids with their parents and kid-free adult fans. Geography wasn’t the only barrier for students’ families, says [node:67608 link=Molly Brennan;], who took the reins as BOM’s artistic director last year. “I think our statistic is that 43 percent of our students are from Spanish-speaking homes,” Brennan says. Though many of the Monkeys instructors speak both English and Spanish by necessity, the public performances have tended to be exclusively in English. Last summer, BOM tested a neighborhood-specific pilot program: four performances of That’s Weird, Abuelita, a bilingual version of Grandma, at Little Village High School, with a blend of sketches in Spanish and English. Abuelita returns this week for a 12-performance run at the Logan Square Arts Center. “We’re excited to do it in Logan Square since there’s a mix of population there between the hipsters who come to That’s Weird, Grandma and Spanish-speaking families,” Farrar says. Many of the sketches in this iteration of Abuelita originated from students at nearby Avondale-Logandale School and Federico García Lorca Elementary. Brennan is codirecting with Madrid-based playwright and director Emilio Williams, who’s also working this summer with Trap Door Theatre and Teatro Luna. He and Brennan met when a friend took him to see That’s Weird, Grandma during his first visit to Chicago last summer. “I totally fell in love with their grandiosity, their amazing sense of ridiculous,” he says. That’s Weird, Abuelita kicks off Wednesday 25; Williams’s Smartphones: A Pocket-Sized Farce opens Thursday 19 at Trap Door.